Final conference of the 7 year research programme "Sustainable Land Management"
Leipzig. The way we use land is changing. Demand for farmland, food and energy seems insatiable, but land is a finite resource. The research programme "Sustainable Land Management" investigated the consequences of this land use under global change and developed strategies for a sustainable use within a 7-year research program ending in 2016. Coordinated by the Helmholtz Centre for Environmental Research (UFZ) a project for coordination, communication, outreach and scientific synthesis was summarizing and integrating results from 12 individual place-based projects across the world. Over 350 international researchers and practitioners are expected at the closing conference running between 7 and 9 March in Berlin. 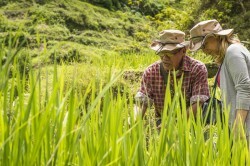 The researchers in one of the 12 regional research projects (LEGATO) investigated the importance of artificially irrigated rice terraces for maintaining species diversity in south-east Asia, how these traditional cultivated landscapes can be retained and how the wealth of existing experience can be used for sustainable land management. 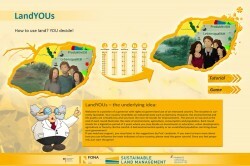 The LandYOUs computer game has been developed to introduce children and young people to the topic of land use. The results of the GLUES project show how important it is that we change our ways or resource use. Amoungst other results GLUES researchers have shown that, contrary to the opinion of many experts, we do not need to increase the amount of land used for agriculture in order to feed the world population until the year 2050. They calculted that global yield could be increased by almost 40 percent, for example from multiple harvests (1). On the contrary they could also demonstrated that there are limits to the use of renewable resources. The analysis showed that production rates of quite a few key resources, such as maize, rice, wheat, fish, meat and milk, have already exceeded their peak rate of production (2). The global outlook for land use is only one out of many elements of the funding programme "Sustainable Land Management", which the Federal Ministry of Education and Research (BMBF) funded to the tune of EUR 75 million between 2010 and 2015. 500 scientists around the globe were involved in twelve research projects in different regions. For example, a team of scientists working in the KULUNDA project produced ecological and economical strategies for sustainable land use in the grasslands of the Siberian steppe region (3). Researchers in the Philippines and Vietnam involved in the LEGATO project analysed the conditions under which ecological rice cultivation can be economically profitable (4). The COMTESS project saw scientists develop measures for countering the rise in sea levels in the North Sea and Baltic Sea through sustainable land management along the coast (5). To allow the individual results relating to the consequences of land use to be consolidated and better assessed and compared, the GLUES researchers defined global land use patterns from more than 30 indicators of agriculture, environment, climate and socio-economics. These archetypes include meadow management systems, degraded forests and agrosystems in the tropics. A global land use map clearly showed, for example, that extensive areas of cultivation in China, India and parts of Russia make up around eleven percent of land area. But the map also highlighted that yields cannot really be increased any more in large parts of western Europe and the USA (6). (6) Václavík,T., Lautenbach, S., Kuemmerle, T., Seppelt, R. 2013: Mapping global land system archetypes. Global Environ. Change, http://dx.doi.org/10.1016/j.gloenvcha.2013.09.004.